To function properly, a hoof must be able to expand on impact, i.e. when bearing weight: from zero at the tip of the toe to the greatest expansion in the area of the heel (which should not be allowed to grow long enough to strike the ground at an angle,thus creating damaging lever forces in the hoof–one of the main causes of navicular syndrome. Furthermore, the sole of the hoof is not intended for compression, but rather is designed to stretch, distributing the impact force in the direction of the ground. Unbearable stresses arise when these physical factors are ignored and the hoof function compromised, as through the use of shoes (which, in fact, disrupt the entire hoof mechanism) or long heels. shutting down the hoof mechanism (as through shoeing or stall rest) will also forestall a satisfactory recovery. A fully functioning hoof mechanism is the prerequisite for normal blood supply in this region, and therefore vital for healing. With deficient blood supply, only poor horn is formed. The crack may not grow out, may become larger, or recur. 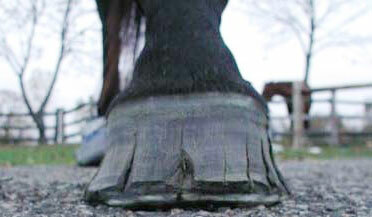 As soon as a hoof with cracks is returned to a natural hoof shape, the cracks will heal and not recur. In any case, strong disinfecting agents are to be avoided; their drying action makes the newly growing horn weak and brittle. What hooves do need is sufficient moisture through daily exposure to water.